Today I stopped in at Carol's Needleworks, in Bridgeville Pa. A bit out of my way, but I have been wanting to check it out for a while now. 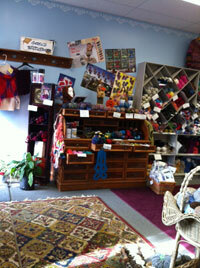 It is a small store, but has a nice selection of yarn, notions and patterns. 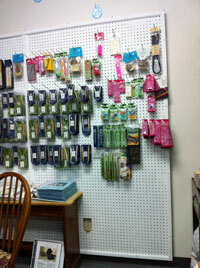 The store is neat and organized. I also had the pleasure of being waited on by Carol herself. Carol is absolutely lovely! Probably one of the nicest people I have ever met. I was greeted by her as soon as I walked in, which is not something you always get upon entering a store these days. Whenever I go to a yarn store, I always ask if they carry any Lorna's Laces; I've been lusting over Helen's Lace for quite some time, but really didn't want to shell out the bucks before fondling it to make sure I felt it was worth the money. (For the record, no store I have been in has ever had Helen's Lace, and Carol was the only one who ever offered to order some for me.) Carol does not carry any Lorna's, but when I told her what I was interested in, she pulled out a color/sample card which had a few strands. Honestly, it wasn't quite as nice as it looks in the pictures on Jimmy Beans.... sorry. I was glad I hadn't decided to buy any! 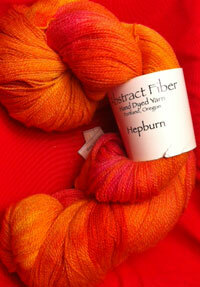 She also suggested a similar yarn by Abstract Fiber called Hepburn, which is 1,000 yards of exquisite merino and silk (80 and 20%, respectively). The color.... Tequila Sunrise. How could I resist? I had to get it. 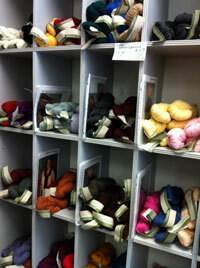 I also fell in love with Audrey from Schaefer Yarn. The color I chose is called The Brontes, after the Bronte sisters of course. 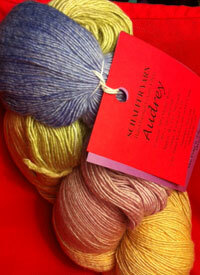 Audrey is a scrumptious blend of 50% merino, 50% cultivated silk. I cannot wait to get this stuff on my needles!! 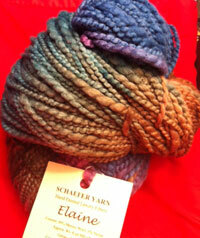 And, to satisfy my chunky yarn cravings I have been having, I picked up a nice hank of Elaine, also from Schaefer. 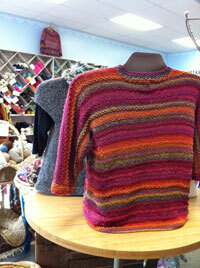 Elaine is 99% merino, 1% nylon. I am not sure what the color is called, that tag must have fallen off. I don't care what it's name is -- it is fabulous! 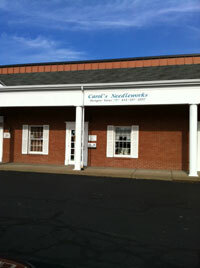 If you are in the area, I do highly recommend stopping in at Carol's Needleworks. She definitely knows her stuff, is extremely nice and eager to please all of her customers. Excellent customer service! 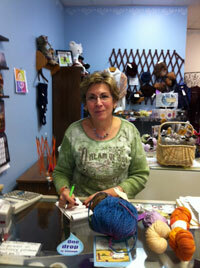 Below are some pictures of the shop, the yarn I got, and one of Carol herself. She let me take the picture since she was having a good hair day! Again, very nice lady and I can't wait to see her again!